Farmgirl Fare: Sunday Dose of Newborn Cute: Peep! More photos and a chick report below. . . It's been a busy week on the farm! Some good changes, some big things accomplished, some very nice weather, one (so far) one new baby chick, and one first time mama hen. I found another chick completely out of its egg yesterday, but sadly it was dead. It looked a little premature, and if the egg had cracked, the mama may have pecked it out herself. We'll never know. But this fluffy little cutie pie is doing just fine. We're hoping more chicks will hatch, so I'm delaying moving them out of their nesting box for as long as I can. I've never had a mama hen continue to sit on her eggs once they've been relocated. That's the only drawback to having nesting boxes off the ground! We have another first time broody hen right now, so I'll tuck the unhatched eggs under her and see if she'll agree to sit on them. That's worked before. It's close quarters right now, without room for a proper waterer. But newborn baby chicks can survive for a few days without food and water (which is why you can ship them through the mail), and this one has already had a drink and a big snack. Looking that adorable must work up quite an appetite. 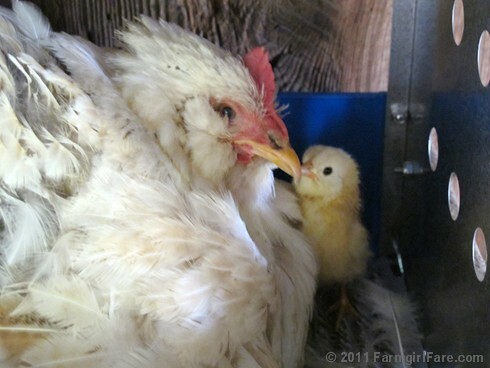 Wondering what you can feed chicks and chickens? I talk more about what we feed our flock in the comments sections of this post. Lots of other chicken owners chimed in there, as well as in the comments section of this post. Want to see more chick pics? 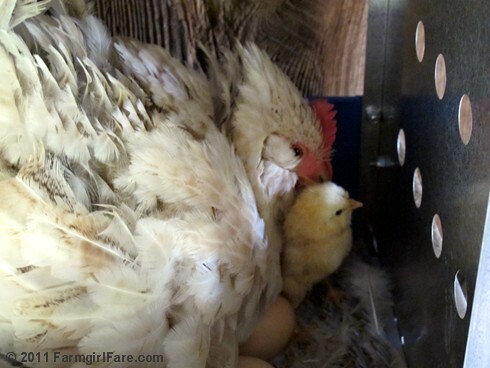 © FarmgirlFare.com, where we don't care whether the chicken or the egg came first—as long as we get to have both. Peep! Good changes and big things accomplished? Dose that mean you've moved to the new house?!?! Adorable! We have some new hatchlings ourselves, but unfortunately they aren't allowed to stay with momma, because they would never survive into adulthood (farm life can be perilous). But it is the mail-order babies that always get me..... How can a ball of fluff on two tiny toothpicks arrive in a box, without food or water for up to two days, be shown water one time and from then on they know exactly how to become a chicken? Sure makes us humans look like slow learners! Gorgeous. I've become fairly philosophical about the hatchlings. I do everything I can to make it easier and I get upset everytime BUT sometimes (always) at least one doesn't make it. We're totally withougt our bore at the moment so I'm carting water to everyone here (as we head into Aussie summer). Trying not to panic and at least I've learnt to drive the bobcat. Absolutely adorable! Nice to see some chickens featured on your bolg. Peep peep! Mom is beautiful! and that chick is just too adorable!! Seriously, the whole thing is quite amazing to me! What big things have been accompished - did you move into the new place yet? The little chick is just adorable. I hope all the other eggs bring new little chicks also. I'm sorry to hear about the one that died. That is just simply wonderful, reading your blog makes you aspired to the simple life! No high heels, wellies please!